Around the neck or over the shoulders, Mad’s Gift is a lush cowl and an elegant wrap – wear it as you wish! Its texture is the striped and dotted knits and purls of the Berry Ladder stitch pattern (an easily mastered 20 stitch by 20 row repeat). The circumference of this piece is worked length-wise with ends grafted, allowing dimensions to be modified as you go, if desired. Short rows that taper the neckline create a smooth drape to the wider hem. 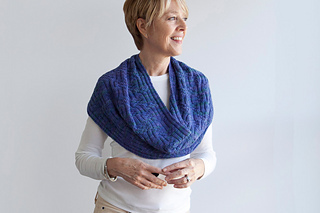 You’ll find this to be an engaging and quick knit – perfect for giving (or keeping!). One size – 13½“ / 34.25 cm by 44¾” / 113.75 cm loop at hem and 31¼“ / 79.5 cm at neckline. Shown in Trio by Brooks Farm Yarn (70% wool, 20% baby alpaca, 10% silk; 420 yards / 166m per 170g skein); 2 skeins, or for comparable yarn, approx. 590 yards / 540 m. Note that extra width may be added to this piece by working additional 20 row repeat sets. Add 40 yards / 36 m for each additional 20 row set. 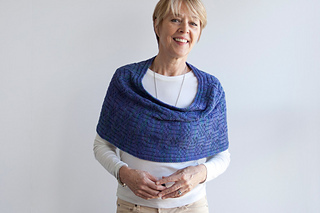 Knit, purl, provisional cast on, short row shaping, grafting textured fabrics, and blocking. 5 page pdf includes pattern instructions, photographs, Berry Ladder stitch pattern chart and description, schematics, instruction links, and definitions for relevant abbreviations.